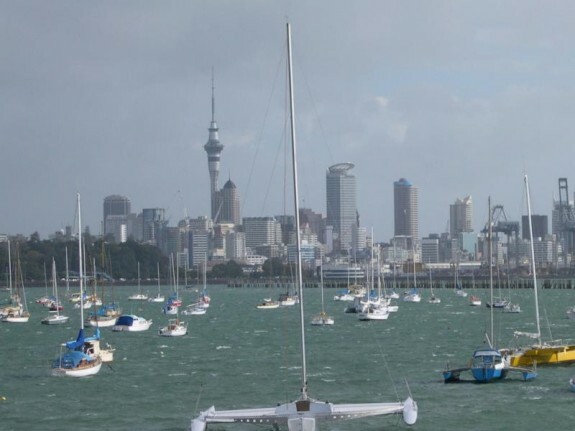 Back to 'Windy Welly' (and it certainly is) for four days. This time we did some proper sightseeing here: They have the fabulous national museum - Te Papa - which has brilliant displays and exhibitions, including the 'Colossal Squid', a four metre monster caught in the cold southern ocean a couple of years ago. She would make seriously big calamari rings! We also went to a great Japanese restaurant where Floss & Max insisted on sitting on the floor as the Nihon-jin (Japanese) do. We also did the compulsory zoo visit and saw a dead ringer for Elvis (see photo) - we've lost count of zoos now! From Wellington we drove north and west out to New Plymouth which is overlooked by the beautiful volcano, Mount Taranaki (sometimes called mount Egmont as a lot of places have English and Maori names). Its a real classic cone, which last erupted about 350 years ago and is due for another bubble around about now. We took a drive up to Egmont village, which is as far as the road goes, then hiked for 45 minutes up about 900 steps to get above the tree-line. The views were amazing - we were above the clouds. The trek to the top takes around five hours which Floss and Max thought was a bit over the top (ha ha) so we didn't try that one. Back in New Plymouth we spent hours and hours in their brilliant library. There is also a fab art gallery which has amazing 'kinetic' (moving) sculptures. We had a great lunch in a converted railway carriage and swam in the pristine surf on the sparkling black sand beaches (you need sandals on these otherwise you burn your feet). We also had a great time building a driftwood den. Max was really pleased to receive blog messages from many of his classmates - thanks very much! Moving on, we drove north to Waitomo and slept in a converted WWII battleship (on dry land). Other accommodation options here included a hobbit house, a train and a WWII bomber. We visited some limestone caverns which were home to countless glowworms which we saw from a boat which crossed the underground lake. The larvae use their glow to attract small flying insects which then get caught up in sticky threads which hang down from the larvae. Then they haul them up and eat them. A bit like fishing! The hungry glowworms glow the brightest! Clever!! After the Glowworm caves we drove a couple of hours to Hamilton where Stef met up with another old schoolfriend, Cindy, who lives. Floss and Max were delighted to have Cyd's children Samantha and Thomas to play with and there was lots of trampolining (with the water hose on and detergent for bubbles), play station and gossip mag reading going on. 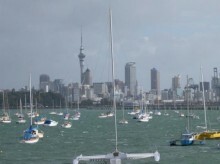 Finally we returned to Auckland late on Thursday for a last day of sightseeing before flying to Hawaii (Oahu). We leave New Zealand on Saturday morning and arrive in Hawaii on Friday evening: Time travel - how cool is that?